Melody and Rick Rogers’ daughter Marissa will graduate from Parish this spring, and their focus will soon turn to a new school family and college. But, as they look to the future, they are also leaving a legacy at Parish. Their generous contribution to the campaign will make it possible for Parish students to explore their passions and strengths, much like their own daughter has. Marissa began dancing in 8th grade. Soon she found her way beyond the classroom to the Rosettes drill team. For the last two years, she has performed as a member of Parish Dance Company. 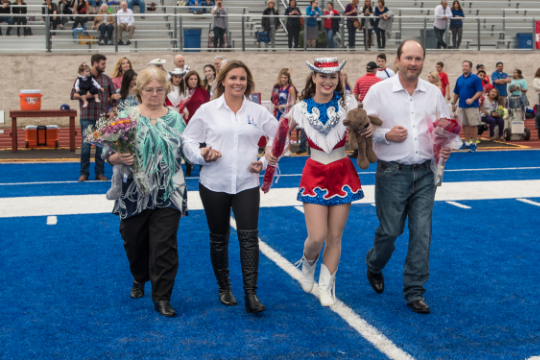 Her passion has led her to experiences including performances at the Alamo Bowl, in the Dallas Children’s Health Holiday Parade and the Independent Schools Association of the Southwest’s Arts Festival. Giving to Parish is a family affair for the Rogers. Rick’s father, Richard Rogers (Mary Kay Ash’s son and co-founder of Mary Kay), is also a Parish alumni parent. In 1989, he created a celebratory gift in honor of 6th grade Parish Day School graduates by initiating a $10,000 challenge to create one of the first endowments for the School. Now, almost three decades later, we extend our gratitude to Melody and Rick for continuing that tradition of giving.